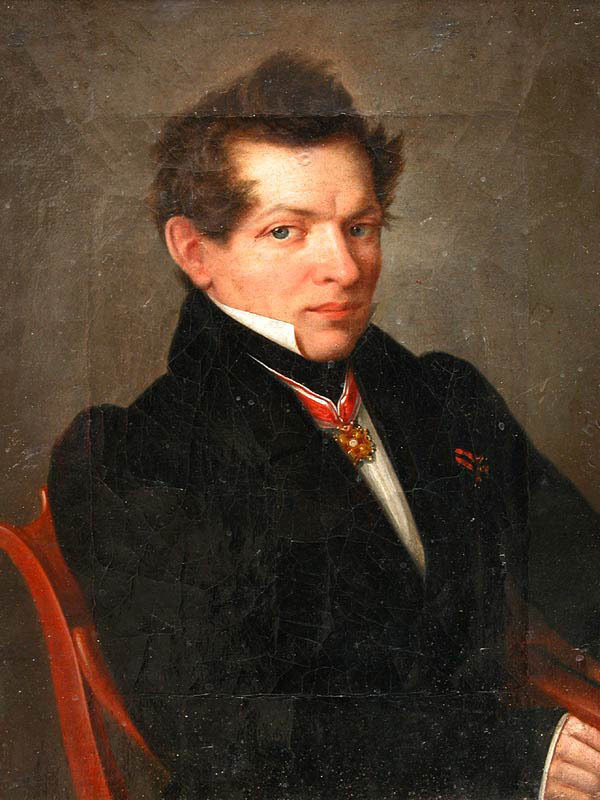 Nikolai Ivanovich Lobachevsky (1792-1856), one of several mathematicians who paved the way to modern geometry - and general relativity. The 19th century saw a lot of changes in natural science (the beginnings of evolution and genetics in biology, electromagnetism and thermodynamics in physics, the discovery of many new elements and processes in chemistry, ), but also in math. Of course, advances in math and natural science intertwine, spurring each other into higher levels of excellence, but often their true connection may not be realized until many years later. One profoundly revolutionary school of math changed physics forever, giving rise eventually to general relativity and the quantum theory of elementary particles and interactions, along with newer untested propositions such as string theory. That school of math goes under the too-broad category of non-Euclidean geometry. Euclid, as you may remember, was a Greek mathematician living in Egypt around 300 BCE (the dates of his birth and death, and most aspects of his life are unknown). His encyclopedic book Elements established the field of geometry as many of us know it from high school: theorems about triangles, parallel lines, points, planes, and the like. However, one foundational postulate in his system of geometry didn’t fit, and bothered mathematicians from Euclid’s time on: if two lines start off parallel, do they stay that way forever? (Parallel means maintaining the same distance from each other.) Euclid said yes, but couldn’t prove it, and neither could anyone that came after him. Latitude and longitude lines on a sphere. Note that the latitudes are parallel, but longitude lines are only parallel at the equator. There is no way to make a grid of squares on the surface of a sphere without leaving gaps or overlapping. The reason is because parallel lines don’t have to stay parallel. If you assume they do, you get Euclidean geometry: a very useful field of study that’s good enough for many applications (structural engineering and architecture immediately come to mind). However, there’s a really important counterexample that’s literally down to Earth: take two people and start them at the Equator heading north. They begin walking in parallel, but eventually their paths converge at the North Pole! 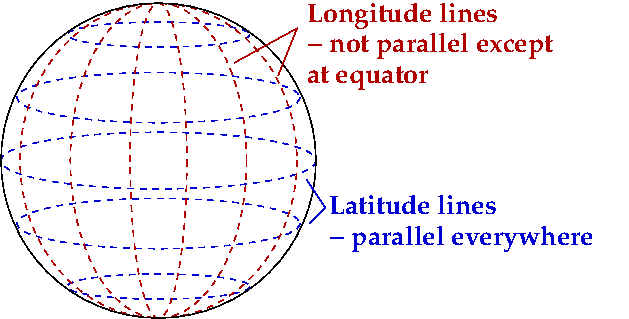 Although consistently parallel lines do exist on the surface of a sphere (latitude lines are also called “parallels” for that reason), but you can’t lay a grid of squares over the globe without leaving gaps. That’s why longitude lines aren’t parallel: they’re designed to be perpendicular to the latitude lines, which means they have to converge somewhere. I’m being slightly unfair to the geometers of the past: since you can construct parallel lines that stay parallel on the surface of a globe, there’s insufficient reason to doubt Euclid on those grounds alone. 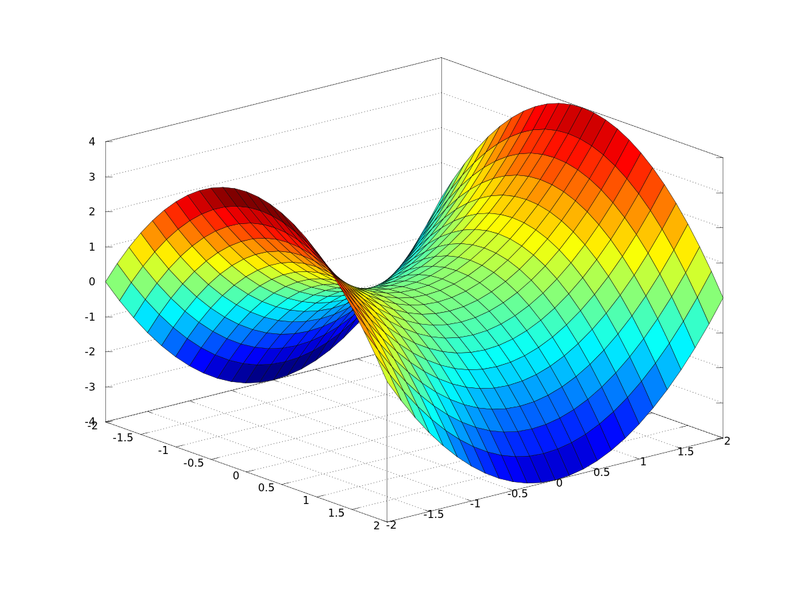 However, yesterday was the birthday of Irish Russian mathematician Nikolai Ivanovich Lobachevsky (December 1, 1792 – February 24, 1856), who discovered a branch of non-Euclidean geometry starting (essentially) from the assumption that initially parallel lines will neither stay parallel nor ever converge. Today Lobachevsky, shares credit for the discovery with János Bolyai and Carl Friedrich Gauss (though Gauss never published his work), so the ideas were in the air in the 1820s and ’30s. Three great circles, one corresponding to the Equator, one corresponding to a longitude line, and the third being an arbitrary one. From our earlier sphere example, you can see that to break from Euclid, you need a surface that isn’t flat. Euclidean geometry holds if you have flat surfaces, and works well if the surface is flat enough. We can pretend the surface of Earth is flat for a lot of purposes because its curvature is large compared to human scales: parallel lines will stay parallel “long enough” to lay foundations for houses and so forth. On other surfaces, we have to define what “straight” means, since all lines look curved from a certain point of view. 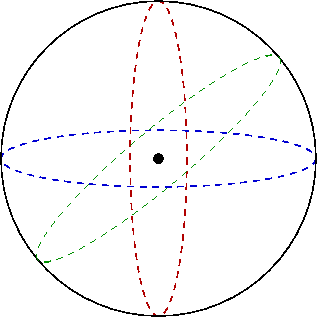 On a sphere, the “straightest possible line” is a great circle: a circle with the same radius and center as the sphere. Longitude lines are great circles, but the only latitude line that’s a great circle is the Equator. Airplanes often follow great circles because they describe the shortest distance between two points. A hyperbolic paraboloid, which is the surface described by the hyperbolic geometry of Lobachevsky. The edges are illusions: the surface extends forever. 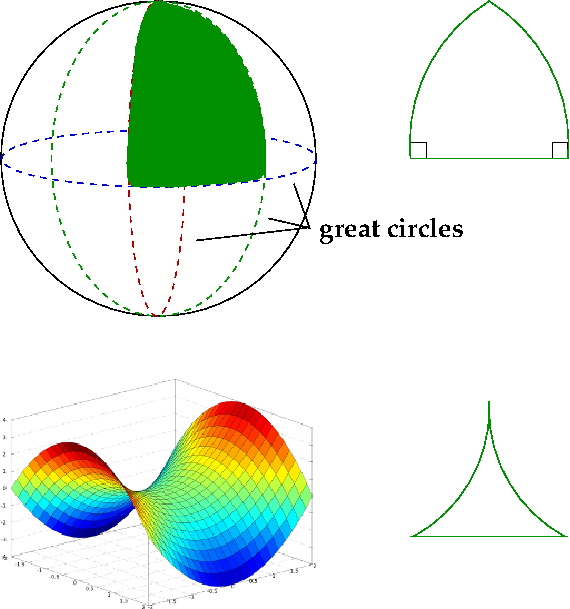 The geometry discovered by Lobachevsky goes by the name hyperbolic geometry it describes the surface of a funky shape called a “hyperbolic paraboloid”, which looks like a saddle or a Pringles™ chip. (Suddenly I’m hungry.) Since the surface never wraps back around on itself, lines that are initially parallel will never converge, much less stay parallel. As with the sphere, there will be a type of line that’s as “straight as possible”, though it isn’t as easy to describe or show as with in spherical geometry. Triangles in spherical and hyperbolic geometry. A triangle in spherical geometry is constructed by taking three great circles and shading in the area they enclose. If you imagine the sphere being an orange, cut along the great circles and lay the peel out on a flat surface to get the triangle. Lines that were straight on the orange don't appear that way when laid out flat, which illustrates a difference between flat Euclidean geometry and curved non-Euclidean geometry. Hyperbolic geometry works similarly, though I defy you to find a hyperbolic orange. In Euclidean geometry, the angles in a triangle always add up to 180°. In spherical geometry, triangles always add up to be greater than 180°, as shown in the picture on the right. In the geometry discovered by Lobachevsky, the angles in a triangle will always add up to be less than 180°. For both, at least two sides of the triangle don’t appear straight if you cut them out and lay them on a flat surface, just a map of the world will always have distortions (as this brilliant xkcd comic describes). Also note that the triangle I picked for spherical geometry has two right angles (though that isn’t strictly necessary), which isn’t possible in Euclidean geometry or hyperbolic geometry. Gravity shapes the geometry of spacetime. Light follows the straightest possible path as dictated by the geometry. You can probably see where I’m going with this: general relativity replaces the Newtonian idea of a gravitational force with the shape of spacetime. As I described in my podcast about gravitational lensing, that means initially parallel beams of light converge, as in spherical geometry. Relativity goes beyond spherical and hyperbolic geometry, though, because the presence of mass shapes its local environment, changing the geometry. In one place, geometry might look somewhat spherical, while in another place, it might look very different indeed. The groundwork laid by Lobachevsky and Bolyai was extended by Bernhard Riemann to allow for surfaces that are flat in one place and curved in another, and it’s his geometry that is the basis for relativity. In the next installment of “The Universe in a Box” series, I’ll get into how Euclidean, hyperbolic, and spherical geometry are good models for the possible geometry of the universe as a whole. Stay tuned!